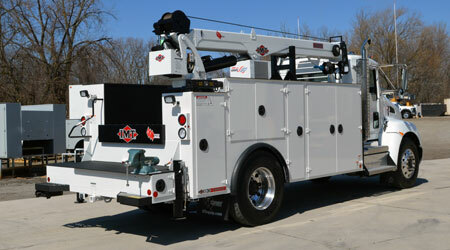 IMT's line of Dominator® Service Truck packages are currently in their 3rd generation of development. You can learn more about IMT with this link. Construction: Dominator bodies have an integrated crane box and a patented inverted-A frame design with torsion plate distributes crane load. Bodies are constructed of 10-gauge galvanneal steel. Much of the body is robotically welded for standardized quality. Hinges are stainless steel. Electrical: The electrical harness is an automotive-style harness with overbraid for protection. All wires are labeled every 3" for easy troubleshooting. Workbench Bumper: The work bench bumper comes standard on all Dominator bodies and is an option for DSC20 bodies. The workbench bumper has integrated rear steps that make it easy to get in and out of the body. It also has plenty of room to mount a vice, weld or clamp a part down. Paint: Bodies are painted with Sherwin Williams Genesis paint in all standard colors. Compartment Coating: Originally used in Pierce Firetrucks, the IMT compartment coating keeps the inside of your compartments from getting scratched up. Dealer Support: IMT has the largest, most professional dealer network in North America. Purchase a Dominator and you will receive unmatched next day parts availability and technical support. Resale Value: IMT service truck packages will typically fetch at least 10% more at auctions. IMT is a known brand that you will not have trouble getting parts.